Perimeter of a figure is explained here. Perimeter is the total length of the boundary of a closed figure. The perimeter of a simple closed figure is the sum of the measures of line-segments which have surrounded the figure. 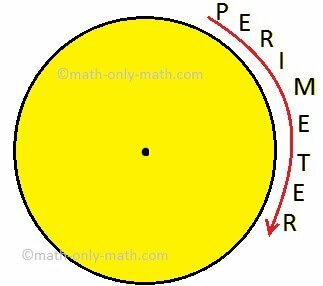 The perimeter of a circle is the measure of its circumference. The perimeter of the circle of center O is its circumference. Ken walks around a playground in his daily morning walk. How far does he walk every morning? The playground is of the shape of a quadrilateral having sides of length 112 m, 85 m, 69 m and 102 m.
Ken walks 368 m around the playground, i.e. around the perimeter, every morning. ● What Time it is?